Sólstafir won't go gentle into that good night. In 2012 southern sludge metal titans Baroness released Yellow and Green, a sweeping double album that left critics enthralled, but seriously pissed a subset of metal heads off. See, Yellow and Green wasn’t traditional metal; at times, it didn’t even try to be, instead focusing on massive songs, painfully gorgeous melodies, and even tracks that could nearly be classed as power ballads. Haters gonna hate, and Baroness toured with the ferocious sound of that album excellently. 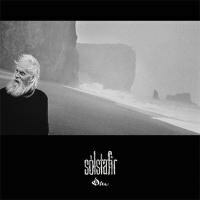 I bring this up because Sólstafir’s newest record is similar in genre disregard. They attack punk, post-rock, chamber, and, yes, metal with the same intensely scary focus that creates the often harrowing, but always entrancing world of Ótta. The men of Sólstafir are from Iceland, and their sound reflects the harsher aspects of their native land. This record taps into the volcanic forces of the island, along with the harsh winters and raging sea. Ótta can be seen as a companion piece of sorts to fellow Icelandic group Sigur Rós’ smoldering Kveikur, the record where the formally ambient and elfin post-rockers churned up hell-fire from lava pits. Ótta is a colder album than that, the cover of the record sums up the emotions flowing through Sólstafir’s songs. It’s a bitter and harsh world that Ótta paints, with a jadedness coming from old age tempered with the sparking anger of young men. Aðalbjörn "Addi" Tryggvason’s voice sits at the core of the emotional power, moving from fringed whispers to choppy barks with ease, the mark of a vocalist learning from both Crass and Talk Talk. “Miðdegi” has Tryggvason at his most vocal cord ripping, shouting threats and regrets over a swirling and fiery guitar lead. It’s not just Tryggvason that aids the album’s brilliant dynamic shifts. Sólstafir have a smart sense of when to ease the tension and fade into more hazy, meditative songs. After the massive, two part bruiser “Nón” (which has a ferocious Thin Lizzy guitar lead charging through the outro) is the mourning cry of “Miðaftann,” based around a sorrowful piano line and weeping guitars. The title track is what truly holds the album together. Simply put, it’s one of the finest songs of any genre released this year, a rare combination of power that comes from grief, loss, and anger. It takes its time while building up to a crushing riff, played on both guitar and banjo. It’s reminiscent of Stoned Jesus’ criminally under looked “I Am the Mountain,” in both size and headbang-worthy moments. The ending few minutes strike the balance that defines Sólstafir; Tryggvason lets out a moving war cry over Svavar "Svabbi" Austmann’s thudding bass before the song fades into a moving string section, as though Tryggvason was a man fighting on his death bed and the strings mark his eulogy. The translation of these tracks reflect a daily cycle, starting with opening track “Lágnætti" (midnight), the aforementioned "Miðdegi" is midday and the 11 plus minute closer "Náttmál" is nighttime. There’s a sense that Ótta isn’t mirroring just a day, but rather a lifespan, from the midnight in the womb to the final night. It’s clear from every note in Ótta that Sólstafir will not go gently into that good night, not without making a few more mammoth tracks.